Figure 1: "A Better Mousetrap", compliments of Pcubed. See full slide deck here. Innovation is the conversion of knowledge and ideas into new or improved products, processes and services to gain a competitive advantage. 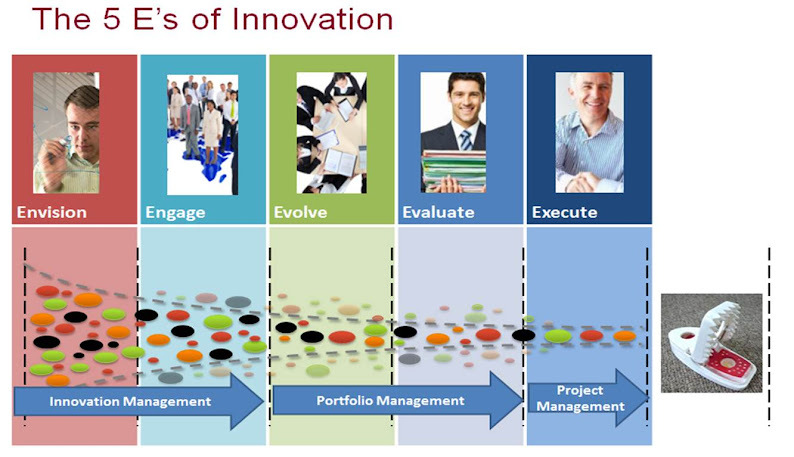 Why is Innovation important to the Project Management world? Some of these new innovative ideas may ultimately become the projects we will manage in the near future. Remember these new projects could be to create a new process or service, not just a new product. Ideation is short for “Idea Generation”. It is the ongoing processes or programs that an organization might institute to help individuals (or groups of individuals) generate new ideas. You could say that Ideation is the first Stage in the Innovation [Project] Lifecycle. We say that Project Management is about “doing things right”. We say that Portfolio Management is about “doing the right things”. Following this line of thinking, we could say that Innovation Management is about “dreaming up different things”; coming up with those wonderful new ideas….or potential projects. Innovation Management would actually encompass all the detailed processes that is needed to “dream up an idea” and then move it through the Innovation Lifecycle until it is a completed project. Click here to answer, then see the results from your peers. For more on Innovation, visit this link.